Based on the 2017 novel by Angie Thomas (prompted by the shooting of Oscar Grant), The Hate U Give, gives a sobering snapshot of racial politics in America (albeit pre-Trump) for the African American community. The Hate U Give certainly doesn’t hide, or manage to escape, its novel roots. At all stages of the film, it leans into this background, from the strong narrative voice over from Starr to the vast intertwined tale that it tells, this is quintessentially and unashamedly a novel turned to film. As such the pacing can feel a little more forced, and less organic than perhaps a good film should be, but it covers a lot of ground in its two and a half hour runtime, both narratively and philosophically. The strength of The Hate U Give is in how it does tackle those issues of race, class, and identity head on. It may not be subtle in its addressing of the subject matter, but neither does it simplifying those issues. They are shown as vastly layered and nuanced, with the weight of history and generational interaction behind them. Although the film does leave you with a sense of hope, it is not that of miraculous change, but rather ongoing process. Generally it is also when the film is at its height. From the opening scene of pre-adolescent children receiving an instructional lecture on how to survive being pulled over by the police without giving them cause to draw and fire, The Hate U Give shows its power to shock. It is something the director George Tillman Jr. continues to demonstrate both in quietly personal character moments and in larger set pieces, allowing a wider audience to grapple with those experiences that may be alien to some of the viewers (and all to familiar to others). True, that may be overdone in the climax of the tale, as all those disparate plot threads come together, but all the good work till that moment will get audiences over the hump. 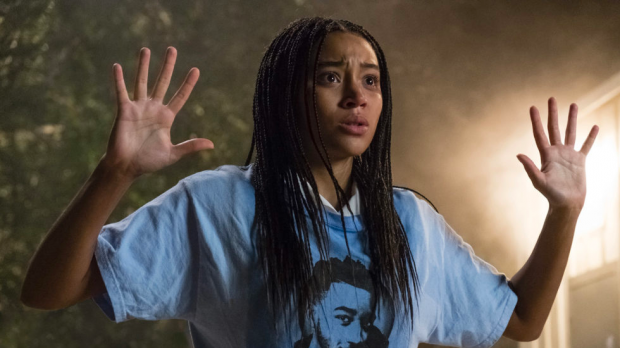 Anchored by an extraordinarily earnest performance by Amandla Stenberg, The Hate U Give is a powerful film that will confront, educate, and awe viewers.